One of these novels was written by an early modernist – an innovator who remains a fixture on university syllabuses, and has been widely acknowledged for his technical achievements and for bringing a sceptical, disillusioned world-view to British fiction. The other writer became immensely popular in his lifetime, was regarded by his younger contemporaries as an exemplar of everything that was wrong about the Edwardian novel, and today in the world of academic Eng.Lit is almost completely disregarded. Which author do you think wrote which novel? The story in which very little happens is Riceyman Steps by Arnold Bennett, and the old-sea-dog yarn is Joseph Conrad’s The Rover. The scholarly neglect of Edwardian novelists, and of Bennett in particular, remains a puzzle to many of us working on the period. Seemingly caught between the three-volume solidity of the Victorian novel and the elegant, fragmenting complexities of modernist fiction, the Edwardian period is usually overlooked, or at best regarded as an interesting but transitional phase. Often it is scorned. This is puzzling not because the origins of this neglect and scorn are unknown – there’s no mystery about this, as will become clear – but because it shows that the twentieth-century canon is alive and kicking and has withstood everything that literary theory has thrown at it for the last fifty years. Bennett stands on the wrong side of a canonical divide drawn in his lifetime by writers we now call modernists – most famously but not exclusively by Virginia Woolf, who brigaded him with Galsworthy and Wells as “the Edwardians”, writers concerned principally with documenting material facts and engaging with social, political, and economic issues, at the expense of creating character and representing inner worlds. In making a case for Bennett, supporters like his biographer Margaret Drabble have found it necessary to demolish Woolf’s arguments. To my mind, Drabble makes a good case in asserting that one of the paradoxes of ‘Mr Bennett and Mrs Brown’ is that Woolf accuses Bennett “of lacking the qualities which he most possessed” – notably his sensitive, psychological insights. Woolf’s extended conceit of an old lady being observed in a railway carriage – Bennett would only notice the external details, but a proper writer would try to imagine her inner life – is indeed a travesty, especially when one considers the genesis (revealed in a 1903 journal entry) of one of Bennett’s most important novels, The Old Wives’ Tale (1908). Arriving at his favourite Paris restaurant, Bennett finds an obese, middle-aged woman sitting at his usual table. He is annoyed; so is she, and she moves to a second seat, and then to a third, breathing heavily, clutching her parcels, arguing with waitresses who begin to laugh at her. True to the aunt sally constructed by Woolf, Bennett notes her clothing – a “puce, flannel dress” beneath her cloak. But this is a spur to imagination, not evidence of a narrow, materialistic realism: he immediately begins to imagine not only a past life for this unfortunate and isolated individual, but a future as well. And the novel that this scene inspired, a sympathetic but unflinching examination of how different people think and feel and how those feelings and thoughts change over time, is a more eloquent refutation of Woolf’s charge than any critical argument. Drabble follows Samuel Hynes in suggesting that Woolf was motivated, at least in part, by pique at Bennett’s comments in ‘Is the Novel Decaying?’ (1923) that Jacob’s Room is “packed and bursting with originality”, is “exquisitely written”, but its “characters do not vitally survive in the mind”. (Woolf’s 1924 essay is very clearly a response to Bennetts piece, as she makes clear in both her argument and her choice of language.) And Drabble implies a further motivation – snobbery. Similarly, John Carey, in making Bennett the “hero” of his provocative The Intellectuals and the Masses (1992), draws attention to the unvarnished class assumptions in Woolf’s essay, exemplified by her identifying the changes in behaviour of “one’s cook” as evidence that human character changed in 1910 or thereabouts (Georgians it seems were much more considerate to the servants than Victorians). In promoting Bennett by combating Woolf, his admirers may, I fear, have done him a disservice. Any attack on Woolf will rebound from her impregnable canonical armour; and by confirming Woolf and Bennett to be antagonists, Hynes, Drabble, and Carey may have inadvertently confirmed the views of today’s modernist scholars that Bennett is indeed beyond the pale. More helpful, perhaps, to Bennett’s cause is Robert Squillace, whose Modernism, Modernity and Arnold Bennett (Cranbury, NJ: Bucknell University Press, 1997) makes a strong case for the commonalities between ‘Edwardians’ and ‘Georgians’, and argues that Bennett’s ‘serious’ novels chart a movement from realism to a version of modernism. This is the Bennett who supported emerging talents from D.H. Lawrence to Robert Graves, who published short stories in the English Review under Ford’s editorship and reviewed under an alias for the New Age, who could not get Ulysses out of his head and who campaigned against the decision to ban it in Britain, who attacked critics of the 1910 Post-Impressionist exhibition (yes, that Post-Impressionist exhibition) as philistines, who enjoyed friendships with Andre Gide, W.H.R. Rivers, Aldous Huxley, and Maurice Ravel. But there are other sides to Bennett too, which help to explain his neglect, but which are also arguments for him to be studied with renewed vigour. As Peter McDonald showed in British Literary Culture and Publishing Practice, 1880-1914 (Cambridge: Cambridge University Press, 1997), in Bennett we have a hugely significant figure in the early twentieth century’s literary field – reviewer, editor, literary critic, public intellectual, journalist, propagandist, social commentator, entertainer, dramatist, and heavyweight novelist. McDonald sees Bennett as a “maverick”, combining the roles of purist and profiteer which, according to the ‘field theory’ which McDonald deploys, should be poles apart. And Bennett did indeed turn without missing a beat from serious, Naturalistic novels like A Man from the North (1898) and Anna of the Five Towns (1902) to wildly improbable, and wildly popular, serials like The Grand Babylon Hotel (1902). Bennett’s breadth and range make him a fascinating figure and help to explode the myth of the writer as isolated genius obeying only the dictates of his or her muse. But it has also provided critics hostile to his eminence in the period with ammunition with which to attack him. Bourdieu says that purists operate in ‘the field of restricted production’, and it’s no surprise that many canonical early twentieth-century writers (Forster, Woolf, Joyce, Eliot) did not fill many shelves or deliver bestsellers to their publishers. In this respect, Bennett appears to stand in stark contrast to those modernists who, for various reasons, did not have to write for a living. Someone who wrote so much, in so many genres, for popular media, as well as writing for the British government during the First World War – he can’t be a proper writer, can he? Such a view tends to rest on assumptions about writing that are essentially mythical and fail to survive contact with knowledge of an author’s – any author’s – relationships with publishers, readers, agents, editors, reviewers, collaborators, supporters, rivals, and friends. If we use this knowledge, figures more canonical than Bennett can be seen operating in decidedly un-purist ways: take Ford’s massive output and his First World War propaganda work, or Conrad and Edward Thomas working for the Daily Mail as book reviewers, or Hardy’s concern to earn a decent living from his fiction. A field theory approach might also help us understand why Woolf is so hostile to Bennett. Although she was just fifteen years younger than Bennett, she turns Bennett into a representative of the old generation – the generation she and other ‘Georgians’ are about to supplant – because he was such a major figure. Bourdieu talks about ‘purist newcomers’ to a cultural field, who need to make their ‘cultural capital’ quickly and decisively. One way to do that is to attack the eminences of the earlier generation – just as Bennett declared the novel as practised by Dickens and Eliot to be moribund. ‘Mr Bennett and Mrs Brown’ might be less a work of literary criticism and more a bid for a share of literary esteem. If so, there is an irony here: one of Bennett’s most powerful themes is inter-generational conflict. Woolf, like Rebecca West later, casts him in the role of Darius Clayhanger or Ephraim Tellwright – a patriarchal figure we need to combat and overcome. However we might explain his neglect, it does no one any good to overlook Bennett. Modernist scholars surely want to know why Woolf based her celebrated manifestos around him, what made it necessary to attack him and his novels in order to make a case for her own work. For cultural critics and book historians, as McDonald has shown, Bennett offers rich resources. And for literary scholars more generally, should we merely accept the canons we have inherited, or should we be prepared to look again at the figures who have been pushed to the margins and reconsider their worth? The most frequently cited of Woolf’s many attacks on Bennett is her 1924 essay ‘Mr Bennett and Mrs Brown’, the text of a lecture to undergraduates at Girton College, Cambridge. The essay has a complex textual history. It elaborates her ‘Modern Novels’, an unsigned piece in the Times Literary Supplement in April 1919, and a shorter, blunter version was first published in December 1923 in The Nation and Athenaeum (editor: Leonard Woolf). T.S. 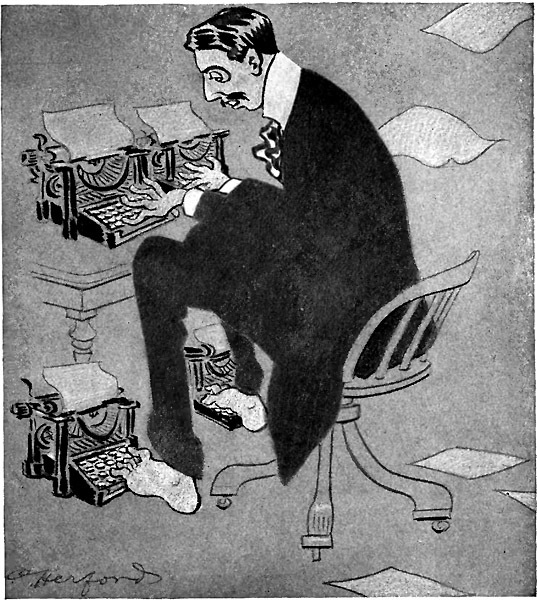 Eliot republished it in The Criterion as ‘Character in Fiction’ (1924). The 1924 essay can be found in Virginia Woolf, Collected Essays, ed. Leonard Woolf, 4 vols., vol. 1 (London: Hogarth, 1966), pp. 319-337. Margaret Drabble, Arnold Bennett, A Biography (London: Weidenfeld & Nicholson, 1974), p. 292. The Journals of Arnold Bennett (London: Cassell, 1932), 18 November 1903. Samuel Hynes, ‘The Whole Contention between Mr Bennett and Mrs Woolf’, NOVEL: A Forum on Fiction 1.1 (Autumn 1967), 34-44. John Carey, The Intellectuals and the Masses: Pride and Prejudice among the Literary Intelligentsia, 1889-1939 (London: Faber & Faber, 1992), pp. 152-181. Pierre Bourdieu, The Field of Cultural Production (Cambridge: Polity Press, 1993), pp. 29-73. This entry was posted in Essays and tagged arnold bennett, edwardian literature, Joseph Conrad, lierary realism, modernism, Mr. Bennett and Mrs. Brown, virginia woolf. Bookmark the permalink.